Bariatric Surgery (obesity surgery / weight loss surgery) performed at leading bariatric surgery hospitals in India is the surgical procedure on the stomach, done to treat Obese or overweight people. It helps obese people to reduce weight as well as prevent various health problems and hazards associated with obesity. Bariatric Surgery at hospitals in India has become a very important option for obese people. Bariatric surgical procedures in India are only considered for people with severe obesity and not for individuals with a mild weight problem.Only people who suffer from morbid obesity (body mass index higher than 40) can have bariatric procedures. Procedure for Bariatric Surgery mainly includes removal of a part of the stomach or small intestine. They are mainly gastrointestinal operation working on some principles that lead to weight loss and prevent morbid obesity. 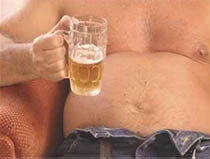 Bypassing part of the stomach reduces the capacity to eat. The small intestine in rearranged to reduce the calories the body can absorb. Bariatric Surgery at hospitals in India is done either by using an open approach, through a 8 to 10 inch incision in the mid abdomen, or using Laporoscopic approach, with ½ to 2 inch incision to allow passing of cameras and instruments to enter the abdomen. Bariatric Surgery being a major surgical procedure takes a few hours to perform and a few days for the patients to feel more or less fit. There are a number of side effects of Bariatric Surgery. These side effects include nausea and vomiting tendencies, specially in the first few months of the surgery due to changed eating habits. There can also be dehydration and food intolerance. There can also be a change in the bowel habits and some amount of hair thinning. The side effects of Bariatric Surgery can also include intolerance to cold, formation of rashes , the 'dumping syndrome' where the patient feels lightheadedness, faintness, weakness, sweating, palpitations, nausea, cramps etc. Bariatric surgery hospitals in India offer the latest technology and appoints expert specialized doctors for the diagnostic, medical and surgical facilities for Bariatric Surgery. We Care India in partnership with bariatric surgery hospitals offer online information on Bariatric Surgery Hospitals in India. Obesity today is recognized as a health problem of epidemic proportions. Obesity refers to a spectrum of problems of excess weight ranging from mild overweight to the morbidly obese. Patients with morbid obesity do not respond to medical means of weight loss. Efforts to treat morbid obesity through controlled diets, behavior modification and exercise programs are only temporarily successful with the patient invariably regaining even more weight than the amount lost. Obesity surgery is the only method by which long-term weight loss can be achieved in these patients. Seven to nine percent (7-9%) people in India are overweight, of which 20 - 25% are morbidly obese which amounts to a staggering 2 - 2.5 million people. Incidence of child hood obesity is on the rise due to changing lifestyles. These people are more likely to develop obesity related complications at an earlier age. 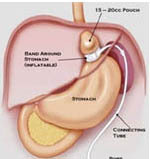 The Intra Gastric Balloon is a non-surgical aid in the treatment of obesity. The Intra Gastric Balloon is a soft, expandable, silicone balloon that is placed inside the stomach via a camera that enters through the mouth and into the stomach. Approximately 2/3 of the stomach is removed. Restricts food intake and reduced acid output. When a Laparoscopic operation is performed, a small video camera inserted into the abdomen allows the surgeon to conduct and view the surgery on a video monitor. Compared to open surgery, some benefits of laparoscopic surgery include Faster recovery and return to pre-surgical level of activity.